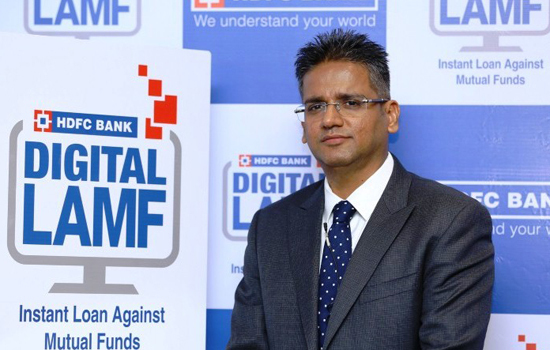 Udaipur: In a first in the country, HDFC Bank today launched its Digital Loan against Mutual Funds (LAMF), in partnership with transfer agent CAMS. Customers can now pledge mutual fund assets online and get overdraft limit set in their account in under 3 minutes. Customers can now avail of this product through the HDFC Bank website in 3 easy steps. With this product, customers can leverage their mutual fund (MFs) portfolio to avail funds for any contingencies or emergencies without liquidating their investments or stopping their regular investment plans/SIPs. Digital Loans against Mutual Funds is available for resident Indians and for portfolios that are individual holdings. After the success of HDFC Bank’s industry first offering ‘Digital Loans against Securities’ launched last year, the Bank has now automated the entire process for ‘Digital Loans against Mutual Funds.’ Today, a customer has to wait for 5-6 days to avail a loan against mutual funds. Even redemption of MFs takes couple of days for the funds to be transferred to the customers' account. With Digital LAMF, customers can design their own loan against mutual fund, choosing which assets from their portfolio they would like to pledge, calculate their overdraft limit eligibility against mutual fund, open a current account online instantly and get the money into the account; all in a matter of minutes.